Get ready for an hour of mind-bending maths and lots of audience participation as award-winning musical maths comedian Kyle D Evans puts a twist on the t-shirts of Hanoi, explains how to win the world paper-folding championships and attempts to fit all of the UK’s rice stocks onto a single chess board (this part usually fails, but he gives it a good go!). Whether you’re a mathsphile or mathsphobe, this show brings joyous number-play to the whole family and there’s even a Fibonacci-based folk song. 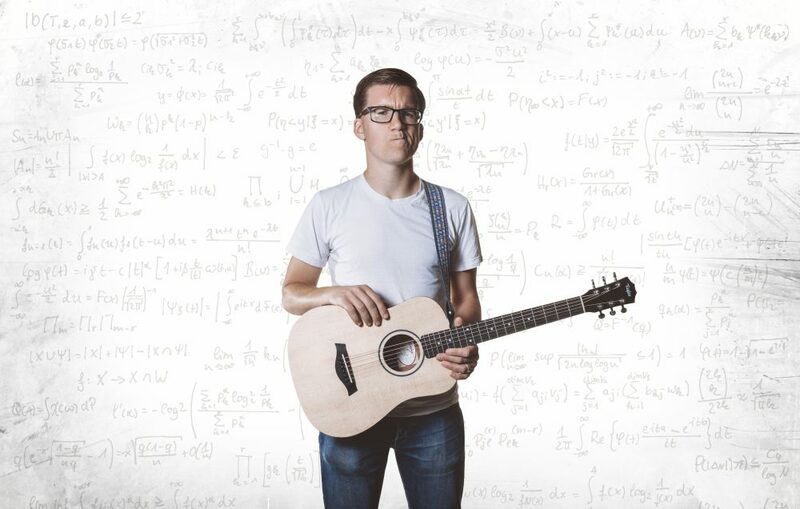 Kyle is an award winning maths communicator (Famelab UK 2016) and musical comedian (Best Stand-up, Swindon Fringe 2018) with a passion for getting us all excited about mathematics. He has performed musical/comedy maths shows for all ages at various events, such as Cheltenham & Manchester Science Festivals, Blue Dot, Green Man, Camp Bestival, London Science Museum and Edinburgh Fringe. He can be found talking to large crowds of teenagers at events such as Maths Inspiration and Maths in Action, and is an occasional contributor to Radio 4’s flagship numbers show ‘More or Less’.